I've started thinking about back to school and here's a fun activity I do every year with my students. 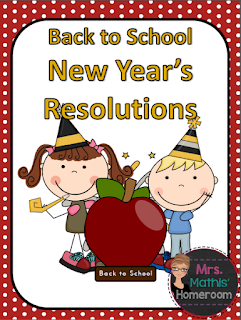 Students also have a great time writing resolutions for their favourite cartoon, book or movie characters before setting their own goals for the year! Through the year, it's a great idea to review these goals with your students to help them succeed in achieving them. Get this freebie by clicking on the picture below!